Today, Kevin and I stood in line for over two hours to attend the TCM screening of The Manchurian Candidate. 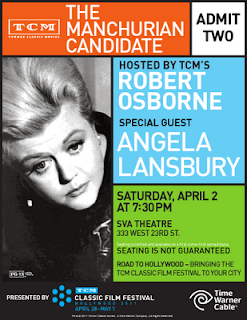 Featured was an interview of Angela Lansbury, the terribly evil Mrs. Iselin﻿ in the film. We sat on the front row - wonderful for the interview, but maybe a little too close for comfort for the film itself. Angela's diverse career and her lovely, elegant personality is a testament to just how good an actress she is in this Oscar-nominated role in this fantastic movie. There was nothing in the interview that I didn't really know already, but her comment that the film is "raw" stuck with me - it isn't flattering and is raw and is frightening. It was really fun watching with a room full of the people, a very diverse bunch, in the very nice School of Visual Arts on 23rd Street. It was clear that many in the theatre had not seen the film and it was amazing hearing their very verbal reactions to this frighteningly realistic film that is as relevant today as it was in 1962. While we were waiting in line, we were listening to the group of teens behind us - one of the girls explained the plot to her friends with just a little slang - "it's about a dude who is brainwashed to kill." Her friend wanted to know who the "chic" in the picture of was - "she's the chic who pulls the strings." Too cool. Great pics! I always thought her role was the best aspect of that film. Her entrance into the theatre from the back of the house last night immediately put me in a "Gypsy" mind-set. Must have been a great evening. 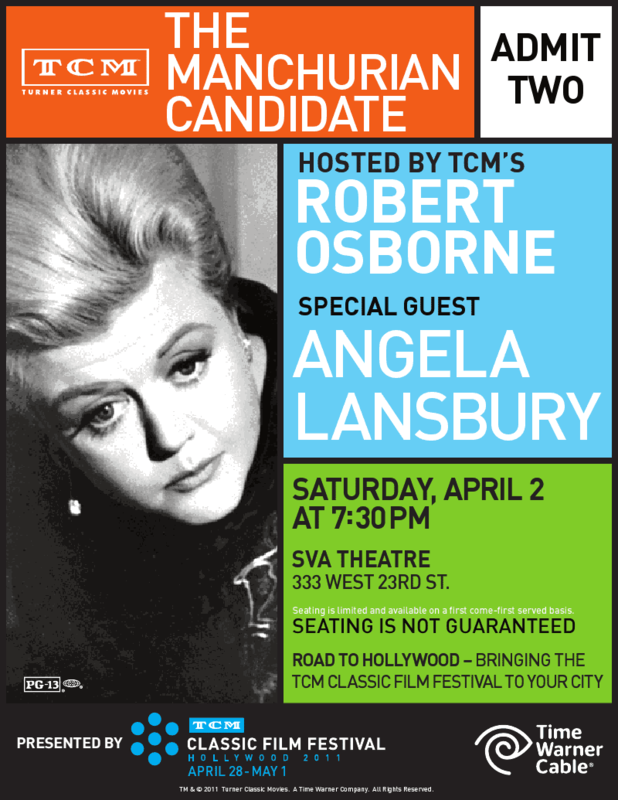 Angela Lansbury gave one of the greatest film performances ever as Mrs. Iselin﻿, and it's a real shame she lost the Oscar that year. I'm terribly disappointed she's not gonna be in Downton Abbey after all. I hope Mr. Popper's Penguins won't be her last film role. The good news she might star in one more Broadway play next year as she said herself in The Leonard Lopate Show. Ash - true, she's what makes the movie. Kevin, a great entrance! Will, Oh I hope she's still in Downton - she's still listed on ibdb. I also heard that news about next season on Broadway which I was glad of especially since she not doing Pygmalion in West End. Great pics of the event! This movie has haunted me for years .. has been 20 years or so since I've seen it on the big screen -- I remember seeing it in Ann Arbor in the late 1980s (i think it was) after the movie had been out of circulation since it was first released. that awful coincidence with the Kennedy assassination and all. which i'll bet they talked about in the Q and A. Such class, this lady, such class. An excellent film overall and Mrs. Shaw towers over the whole ensemble. She is spot-on in each and every second her horrendous character is on the screen, she's as scary as she is in the novel;she is the personification of the horror shown in this film. I always love watching Lansbury in this role-I hope she loved playing the character as much as her engaging role seems to indicate-how cathartic, eh? I always enjoy listening to Robert Osborne's comments on movies, he's one of the few who keep to professionalism while bringing new information to the table. I love your photos, Sarah-they're great to see! Thanks for sharing...love her in this movie!